As you can see from the previous picture, Mitchell is still being the world’s best big brother to little Hestia. Everyone is pitching in to avoid another Manfred toddler skilling fail, which Callie took particularly hard. Hestia is going to be able to walk, talk, and not crap herself when we’re through with her! Natalie is also going to become a teenager today! I know a few of you were waiting for this, and I’m sure everyone is curious about her looks. Manfred is doing well, all things considered. His Insane trait means that he’s a lot like his mother, which I think is fantastic. Manfred also loves costumes, and he’s going to wander around wearing silly costumes and finger-gunning himself in the mirror, I’m sure as hell not stopping him. Oooh prom! You know what that means, eh? PROM SPAM. Also Natalie should be allowed to attend, as she ages up just in time! Meanwhile, Callie finally got to eat her favourite food: Dim Sum! Angelo managed to reach level 9 of Cooking, so naturally he had to cook his daughter’s favourite food. I don’t think Callie has ever eaten it before, unless Auden or Zhan cooked it before they died. Speaking of Angelo, he’s still doing pretty well, though he seems to be feeling his age a little bit. Natalie doesn’t get a birthday cake, because I momentarily forgot her birthday. She was wandering about Bridgeport, trying to collect bugs for an opportunity. Whew. At least she’s understanding! …and here she is as a teenager! She rolled Party Animal for her Teen trait. Here’s a better picture of her face, pre-makeover. She’s got a lot of Heimie in her, but I think she’s got Callie’s fuller lips. I think she’s quite pretty! Definitely a unique Sim, which just makes me like her even more. Here she is, post-makeover. I believe this is her formal outfit – I think she had a tea party before she went out, hence the weird outfit. Natalie gave me a bit of a rocker/party girl vibe, which I tried to reflect in her clothing. Very purple and ~edgy~. Naturally, if Natalie grew up, that means Puzzle is due to grow up too! Griselda continues to churn out novel after novel. She’s basically tethered to her computer at this point, which is probably safer for everyone. Yeah it’s definitely safer to chain her to the computer. Ah yes, those classic Deep Teenager Thoughts™. I was trying to put Natalie to bed, when I saw this pop up. There are many, many things wrong with this screenshot. Why is Manfred still awake at 12:30 on a school night? WHY AM I MISSING THIS INTERACTION?! IT’S PROBABLY AWFUL AND HILARIOUS. Manfred put himself to bed before I could catch Heimrich patronizing him in person. 😦 I did catch Callie freaking out about her (non-existent) wrinkles. Hestia’s toddler training continued. It actually plunged some other household residents into a state of regression. I also decided to turn the small room next to Natalie’s bedroom into a music room. Natalie hasn’t rolled a lifetime wish yet, and she has the Virtuoso trait, so I’d like her to roll a Music-related LTW to go with it. Most Scatterdays who roll Virtuoso never do a dang thing with it, and I’d like to change that. Heimrich graciously let Mitchell tag out of toddler training, but unfortunately teaching Hestia to talk was torture for him. Yeah, I’d be throwing a tantrum too. Oh. I see. Yeah, I’d definitely throw a tantrum if I had to go through childhood again. Mitchell is so in sync with his little sister that he also decided to throw a tantrum today. At least Natalie’s in a better mood. I actually squealed with delight when I saw Manfred wandering around the house wearing his tiny tux. He’s adorable! Once again, the paparazzi try to spread rumours about my Sims that are actually true. -_- Remember the Chinese tourist incident? Okay, so Grissy didn’t actually beat him up, but there was some conflict. Callie’s still in full-on midlife crisis mode, too. She still wants to Woohoo and make out with her husband, but screw that, let’s flirt with someone else! UGH. Poor Mitchell exhausted himself by staying up late to do toddler training. Natalie decided to paint, as she had a few Painting skill-related wishes. Kids these days. When I was teenager we used black to represent angst! The grandparents are mostly left to their own devices these days. I have no reason to micromanage them anymore! Callie went back to work, after finally burning through all of her old maternity leave, and she got a promotion on her first day back! Naturally, she picked the Directing branch, for her Lifetime Wish. That’s probably for the best, Callie. It’s time for the youngest Gen. 5 kiddo to age into a child! Okay, so Hestia is actually pretty cute when she’s not all stretched out during an age transition. Aww Natalie got this opportunity! However, I declined it because the house is full, I don’t want Natalie to spend every waking moment searching for a Rainbow Gem, and Angelo already has the Imaginary Friend potion in his inventory (Natalie declined it last chapter). The nursery has been transformed into a very lilac bedroom for Hestia. She gets a big girl bed and everything! Being a child means more opportunities to bond with Mitchell, too. It didn’t take long for him to introduce Hestia to the wonders of video games. Yes, Hestia being a child just means even more bonding opportunities! I feel like Callie is overcompensating for the whole wanting to flirt with someone else thing. I just can’t stand in the way of their happiness, though! I love my delightfully pervy Sims. Poor Natalie’s first day of high school means her first interactions with weird creepy boys. RUN AWAY, HE ONLY WANTS YOUR SWEET SIMOLEONS! Heimrich is a good boss! Hahaha I weep for Mitchell’s sleep schedule. Natalie is much more productive that her brother, so after a quick snack, she went to work at Heimrich’s Business Factory for an opportunity. Apparently having your daughter work for you means promotions? Heimrich is now only one level away from achieving his Lifetime Wish! Callie’s day was just as exciting. It quickly went downhill, though. Heimrich is no slacker. Getting a promotion and maxing a skill in the same day takes some serious…uh….skills. Griselda also managed to finish another novel! A Punch and a Poke sounds wonderfully deviant, and exactly like something Grissy would write. I also managed to finally take heir and spouse portraits of Callie and Heimrich! Callie’s portrait also has a bonus Hestia, which ends up being a good thing because of…reasons. I stuck all of the heir and spouse portraits in the music room, because the walls looked very bare, and there’s room for two more generations of portraits. Mitchell is definitely not living up to his namesake. I, personally, am okay with that. I can’t imagine Joe Don’s Mitchell making honour roll – he’d just eat a bunch of rolls instead. Natalie looks lovely in her previously seen very rock/emo/whatever the kids are into nowadays purple getup. Mitchell gets the frilly 70s tux, for many reasons. I’d snub him for a lot less than insulting my best (imaginary) friend. Frankly, Mitchell brought this on himself. Yup, Natalie and Mitchell ended up being Prom King and Queen. They both got rejected by crushes too. Overall, not the best prom night. Mitchell and Natalie weren’t the only Scatterdays having a fun night out! Angelo had a Logic-skill related opportunity to visit the theatre and destroy some jerk at chess. Hestia was stuck at home, and clearly did not have a good night. Not only did he down some jerk in a game of chess, but Angelo also managed to maximize his Cooking skill! Yes! I caught Heimrich trying to patronize Manfred again! Deangelo is only a day or two younger than Natalie, so naturally he also aged into a teen. He was also bitten by the unfortunate Male Pigtails Bug. Speaking of Frankie, she’s setting the town ablaze – literally! She’s also fighting with her long-term partner and Deangelo’s father, Matthew Hamming. This always happens, thanks to her Insane trait, so Matthew probably did something like fail to pick up a coin on the street, which is unacceptable to Frankie. Prom night sounded hard! So many rejections, but the teens each got crowned, so, I guess, that’s something? Natalie and Hestia are both adorable. Natalie is definitely unique, which is what I was going for this generation. Prom night was not fun for the teens. 😦 Ah well, at least it was entertaining! I love Hestia’s child (and toddler?) hairstyle! That bun with the lil’ braid is so cute! Agree with you about Natalie’s looks, unique but still pretty. It’s going to be an interesting heir poll! Have never seen the “patronize” interaction before, how random! Yup, Hestia has the same toddler and child hair! It’s an older hair, I *think* it’s by Peggy? I think it works best for kiddos, even though it’s enabled for all ages. I’m glad you like Natalie’s looks! Sadly, there won’t be an heir poll this time around, for…reasons…that will be explained not in the next chapter, but the chapter after that. You’re up on my catching-up list! I love Natalie! What a great face, and a great makeover! William, my Gen 2 ISBI spouse, liked to patronize his kids. He was Mean Spirited amongst other undesirable traits, and I figured that was it. I’m so glad you like Natalie! I love her unique face. I think she got the best of both Heimrich and Callie. 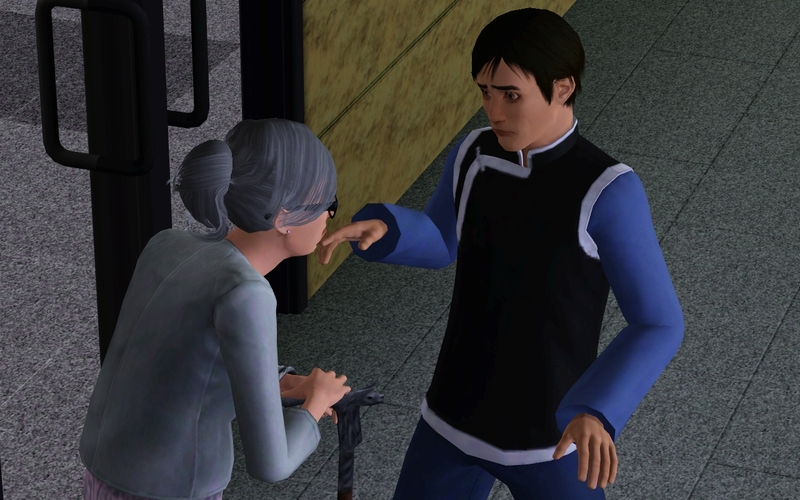 Maybe both Mean-Spirited and Dislikes Children Sims can patronize kids? It certainly seems like something a Mean-Spirited Sim would do. Thanks for catching up! I’m sorry my blog thought you were spam. It should be fixed by now! Manfred is pretty awesome for someone who flopped around as a toddler. Makes him do other things than watch TV. Angelo boasting about Hestia to Callie, Omg Sim Elders, don’t ever change. Natalie defenitely looks better in-game than in CAS. Lucky, most sims have it the other way around. And I love her already.